Bridge Vacation Rentals offers you the best value in Waikiki. Spend your money on your vacation, not on your hotel room! Our stunning 1-bedroom oceanview suite has a king-sized bed in the bedroom and a sofa bed in the living room, plus a day bed with two twin beds allowing maximum comfort for 6 guests. It comes with a kitchen and has spectacular views of the water, mountains, and city lights. There are 2 lanais (balconies) from where you can enjoy the cool ocean breezes or watch the canoe races on the Ala Wai Canal. The suite is decorated in local decor so you can completely immerse yourself in your Hawaiian vacation. 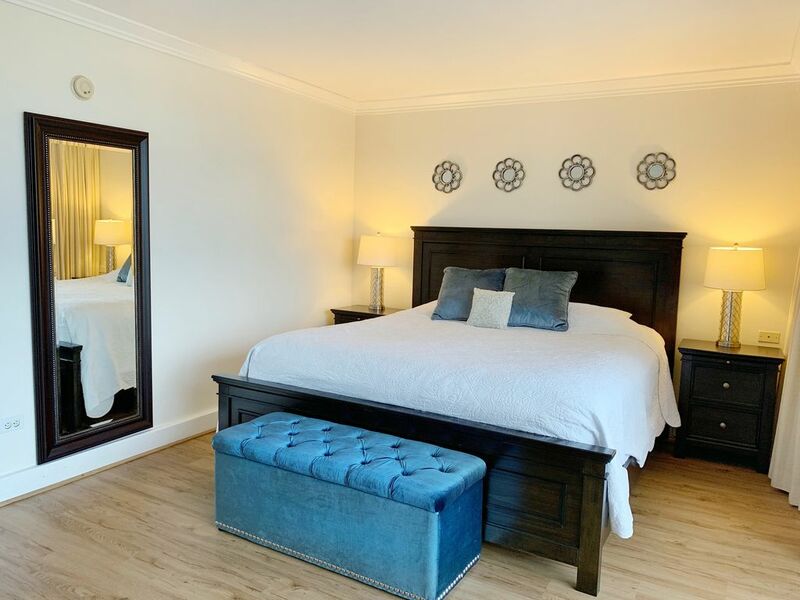 It was originally a 2-bedroom that was remodeled to make a 1-bedroom, so the unit stretches from one end of the building to the other, giving ample space to relax and make yourself at home. Also unique to this suite is the convenience of having a washer and dryer in the unit. Wake up and cook breakfast in the kitchen (complete with oven so you can bake!) or savor a delicious breakfast at the many restaurants close by, then take a leisurely stroll to the world-famous Waikiki Beach where you can take surf lessons, watch a hula performance, or just lay out and sunbathe on the beach. Along the way you will pass the Waikiki Strip and encounter dozens of world-class shops, eateries, and entertainment. Browse through the local stores and pick up unique souvenirs. With all the sights and sounds to take in, walking the Waikiki Strip could easily be a full day's excursion! Everything is within walking distance, but if you choose to venture out farther there are major bus and trolley lines half a block away from the property. If shopping is your thrill, the island's biggest mall (Ala Moana Shopping Center) is only a mile away. The Hawaii Convention Center is less than a mile away, and Hawaii's historical sites like Iolani Palace, Chinatown, and Downtown Honolulu are less than 4 miles away. When you're done exploring, stay in and enjoy all that the property has to offer! The Royal Garden has been newly-renovated by Wyndham Vacation Resorts and features a pool, two saunas, an outdoor BBQ terrace, a fitness center, complimentary 24-hour laundry facilities and complimentary WiFi in each suite. Need a relaxing full-body or foot massage? Ask us about our in-room mobile massage service! Bridge Vacation Rentals allows you to enjoy 5-star accommodations for less than what you would pay for a regular hotel room (please note that this is a privately-owned unit inside the Wyndham Resort. Although you are able to use most of the resort amenities, you are renting from a private owner that is in no way connected to the Wyndham Resort). We look forward to helping you create lasting Hawaiian memories at one of the best prices in Waikiki! Easy walking distance to Waikiki! Located right at the beginning of the famous Waikiki Shopping Strip makes it convenient to access food, shops, and the beach. Located in a quiet residential neighborhood so you're far from the tourists but close enough to all the action. Accommodations and amenities in Waikiki without paying resort prices! Also unique to this suite is the stackable washer and dryer that is in the unit so guests don't have to go downstairs to the laundry room. Great place! Excellent views! Spacious. Centrally located. I wish the pool was heated but other than that it was a wonderful stay. Close to many restaurants and only 10 minutes from the beach. This was a great view and location. Away from the busy streets and people. I recommend staying here. Spacious 1 bedroom in great location! The unit had everything we needed and Hazel was very prompt & friendly in correspondence. The location is about an 8 minute walk to the beach, through a nice park. Would gladly stay again in the future! Thank you for your review. It was our pleasure to accommodate you. We're glad you enjoyed your stay with us! Please contact us if you're ever back on the islands. We'd love to welcome you back as our guest. Rental was very close to beach easy walking distance through the park. Peak season lots of traffic noise and construction to hotel next door. No fault of the owner. Cool breeze though either lanai doors at night. Good view of fire works. BBQ'd one night ,front desk was very helpful to light up and ensure we had utensils. I would suggest a blind or curtain for the kitchen window, very bright in the morning if you have people sleeping in the main living room. Plenty of pots pans and dishes. The Tupperware came in handy for taking snacks to the beach. There is a Safeway close by. If you want to supply the condo. It's about a 25 min walk. We took a taxi back only about $12.00 . Well worth it. The ABC's near by are pricey but convenient. Laundry very convenient in the condo. We booked early April/May for the price the VRBO site stated, our offer was accepted . Then a week later they came back to us saying that wasn't peak season price. And if we still wanted the condo we would need to pay more or lose the booking. No choice but to pay because everything was either out of our price range or all ready taken. It would have been nice to see the real price up front. I was informed it's a software problem?? We used lots of tour packages for the convince of not driving. Most will pick you up right at the hotel or within a block or two. Buses are easy to navigate and cheap. Overall a very clean and decent place to stay. Your out most of the day and it's nice place to come home too. The unit has 2 balconies that provide views of the ocean and the Ala Wai. Close to restaurants and easy walk to Waikiki beach, shops and hotels. Rates start at $225 - $325 per night, depending on availability, season, and number of guests. Rates may be slightly higher during all U.S. holidays. Rates are subject to change until payment has been received.